It’s not the big things that will hurt you, it’s the little ones. We all know that the most dangerous mammal in Africa is the hippopotamus, don’t we? Except that it’s not true. The most dangerous mammal in the one you see in the mirror every morning. Human beings are much more likely to kill you than any other two or four-legged creature. Even more dangerous are the critters with six legs such as the mosquito. Even more dangerous are the ones even smaller with no legs at all: bacteria and viruses. As consumers, the same rules apply. The big, obvious, “in your face” things like advertisements, special offers and fancy displays of goods in windows are seductive but it’s not them that will end up hurting you. It’s the little things that will do that. The little words in the contract you sign. The words you either didn’t read or didn’t understand. Despite being a passionate believer in the liberal, free market this is an area where my former radical left-wing opinions still sometimes appear. The capitalists are screwing us, the workers. That’s because they can afford lawyers and we can’t. Or perhaps they can just afford better ones than we can. They can write contracts that exploit our ignorance, naiveté or laziness. 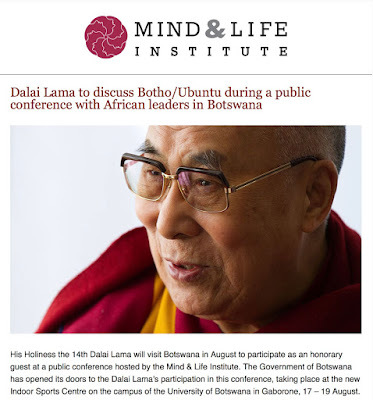 Mmegi readers will know that the leader of Tibetan Buddhism, Tenzin Gyatso, the 14th Dalai Lama was due to speak in Botswana, probably right now as you are reading this. However, following his “exhaustion” he was forced to cancel his appearance just a week before he was due to arrive. I’m not going to comment on the politics of this. As you’ll all know the Chinese government were very angry with us and our government for permitting him to come here and exercise his right to speak his mind on such dangerous topics as spirituality, Botho and Ubuntu. No, I’m really not going to comment on their bullying tactics, colonialism and contempt for our tradition of free and open speech. No, I really won’t. Instead I’ll avoid such sensitive subjects and talk about the contract that applied to anyone who was planning to attend the event and listen to him speak. Several people have asked for our advice following the cancellation and how they should address the organisers who have apparently said that the money people paid to be there either won’t or can’t be refunded. Is this reasonable, they ask? In fact, what matters most is not whether their refusal is reasonable or not, what actually matters is what the contract says. Yes, technically speaking, the non-appearance of the key person at the event, the keynote speaker, the (almost) universally respected leader of a global religion is a “program change”, in the same way that KFC without chicken, a bar without beer or a bank without money would be a “program change”. And yes, the Dalai Lama was only one speaker at the event, there were plenty of other people scheduled to say their thing. But can you name even one of them? KFC can give you chips without chicken, a bar can serve you lemonade or wine and a bank can pester you with Know Your Customer information demands, but a Dalai Lama event without the Dalai Lama is different. But regardless, there’s no refund and that’s probably understandable. The organisers have already paid a deposit for the venue and the catering, bought flights for the other people who were going to speak and paid staff their salary for persuading people to stand up against a foreign government determined to tell us how to run our country and dictate who can speak their minds here. Whoops, I went there again, sorry. So they’ve incurred costs and a full refund probably isn’t morally possible but the small print is what matters most. In fact, it’s the only thing that matters. But maybe the organisers should have followed the advice offered by a member of our Facebook group. Why didn’t they take out insurance against this happening? It would have added to everyone’s costs but it would have enabled them to offer their disappointed customers something instead of just irritation and frustration. The thing that worries me most is how often we hear from consumers who are faced with financial ruin because they didn’t read a contract. Or perhaps they did read it but they didn’t understand it. It doesn’t matter whether it’s a furniture store’s hire purchase agreement, an insurance policy, a cellphone contract, a banking agreement or a lease, so many people simply sign on the dotted line and don’t take the time to understand what it is they’re committing themselves to. And then they get into trouble. Perhaps the most unsettling clause I ever saw in a contract was in a hire purchase agreement. After several pages of tiny text, including a mixture of Latin, long words and confusion, it finished with a statement something like “I have understood this agreement and promise never to say that I didn’t”. So what should we do? How can you and I protect ourselves? The first thing is simple. Never, under any circumstances, sign a document that you haven’t read and understood. Secondly, always ask to take an agreement away with you so you can read it at leisure. Go back the next day and sign it if you think you commit to it. If a store won’t let you take the agreement away then ask yourself what it is they’re trying to hide. Another thing you can do is take control. Just above your signature, write something like “I do not agree to clause X”, or “I have not read or fully understood this agreement”. Maybe even cross out and initial any clause you don’t like. Always write “Not inspected or tested” on any delivery note you ever see. Above all, understand the importance of your signature. If you sign it, you’re committed and there’s often no way out. UPDATE: The organisers have stated that refunds WILL be available to those who request them. Good news!